Time tracking designed for online teams valuing their time. Smooth, accurate, beautiful - time tracking as it should be. All features you need in one place! What’s more! All features are available in all plans and for good. You can see how your team is doing: who’s tracking time and who’s overworked. You can add new trackers or start the timer from the web version of Timenotes as well as from the Chrome extension and the mobile app. 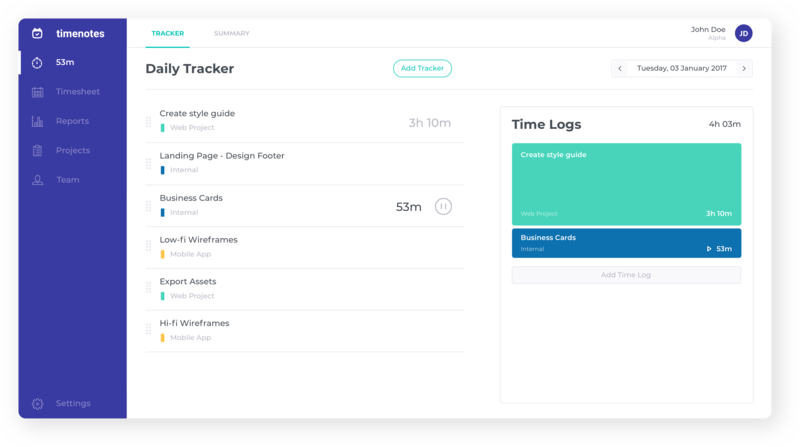 If you’re asking the question: where’s my (or my team's) time going, this feature will help you organize your time better. Just start and stop the tracker with one click. You can do this from the web app, the mobile app or the browser plugin. 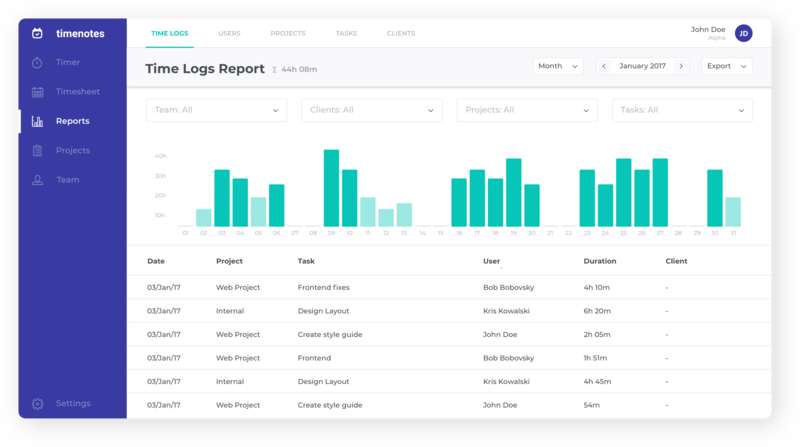 Reports page allows you to search, browse and filter your time logs data, so you can get useful insights, or generate client reports in no time. Daily tracker helps your team to organize their work during the day, save the tasks, run and stop time trackers, as well as adjust the logs on the fly. 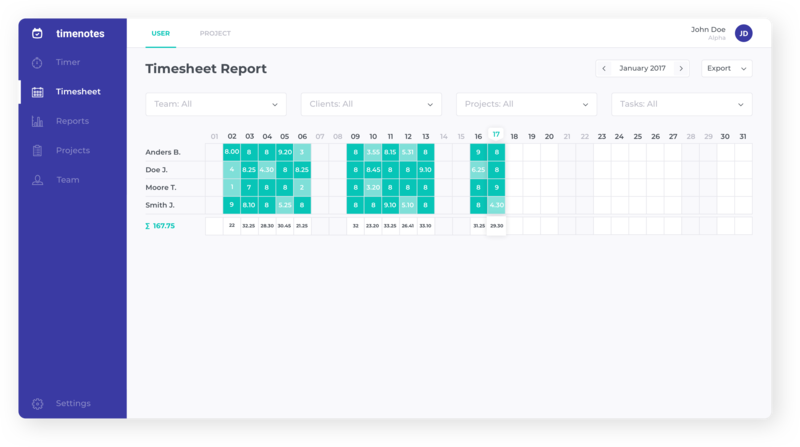 Monthly timesheet makes it easy for you to check what is your team currently working on, who is on holidays or just not tracking time properly. Start free and save a lot as you grow! Timenotes is FREE up to 5 members and cost $35 per month flat for teams bigger than that, for the whole company. Remember, you are always a first class passenger with us, all features are included, even on a FREE plan! Do I need to pay extra for more people? No, unlike most platforms, we don’t charge you based on numbers of users. No matter if you need 6 or 50 users, the price is always the same. Try Free plan! You can log time yourself and invite 4 additional team members and give us a chance to show what we have to offer. All features are included. Yes. We’ll never charge you extra for more projects in Timenotes. If you have questions we didn’t cover, we’d happy to answer them. What if I want to give up one day? We hope not! :) In case you want to leave us for good you can do it with one click, without us asking why. Should I add card number during signup? No! We don't ask for your card number upfront. You’ll be asked to add a card number only if you’ll decide to upgrade your plan to 6+ members team. Your team is bigger than 5? Try out with free plan and decide about upgrading plan any time later. Don’t worry, we don’t ask for your card number upfront, take your time to decide.